The chances are that your house move is really exciting for you grown-ups. It may represent a new start, a new job, or just improving your lives by moving to a bigger place. For your younger children, however, it can be a huge upheaval, even if it’s just down the road. Here’s how to get your little ones ready to go. As soon as you know it’s on talk to your children about it. They won’t understand “relocating” or “mortgage in principle”, but they’ll understand “going to live in a new house in August”. Make it a happy announcement, even if you have mixed feelings. 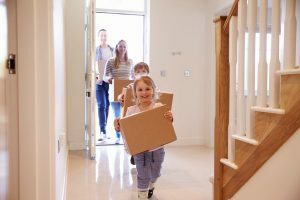 One surprising thing you might find is that the children are worried about your old house being lonely and empty, so reassure them that some lovely new people will be living there after you’ve gone. Even if you’re sad or anxious, you need to keep this to yourself and always be enthusiastic and happy about the move when you talk about it. Don’t dismiss your children’s fears though; always reassure them. When you have a moving date, mark it in your calendar and start counting down the days. If there are other moving-related events, like furniture going into storage before you go, then mark these down too. Many children worry that they’ll have to leave their toys behind, or that they won’t be able to take their pets with them. Make sure you explain (as many times as necessary) how everything will work. The vans will come, the boxes will go into it, the cat will stay with Granny for a couple of days and then you’ll drive to the new house and unpack everything. Head to the local playground and the café so you get a feel for the street and area. If possible, go inside the new house and point out where beds, TVs and garden toys will go. If this isn’t possible, then your estate agent might be able to take a short walkthrough video of the property – be prepared to watch this quite a few times, though.